Past efforts to combat the carbon footprint of pavement have shown an annoying tendency to backfire. Now, researchers are considering the full lifecycle of the stuff beneath our feet. When it comes to beating back climate change, the big ideas get the most buzz. But among talk of banning gas-burning cars, making tech companies run server farms on renewable energy, and geo-engineering the planet into a state of salvation, the people researching pavement have a message: Don't overlook that boring stuff beneath your wheels and your feet. After all, pavement—and the asphalt, concrete, and steel that live inside it—is everywhere. If you look up and out a window right now and don’t see any, I'll pay you a dollar. (I won’t.) And with the federal government reportedly inching—really, inching—toward a trillion dollar injection into American infrastructure, now may be the perfect time to make the gray stuff just a shade greener. Past efforts to combat the carbon footprint of pavement have shown an annoying tendency to backfire. A pavement composed of all-recycled materials sounds great, until you consider that it requires more truck-driving construction workers to maintain it, and might need to be replaced in a couple of years instead of a handful. You can alter the makeup of pavement to retain less heat and reduce air conditioning use—but you can also go too far and trigger higher heating costs. The good news is that researchers like Harvey have been studying the entire lifecycle of pavement for the past decade or so, from the quarries to the production to the paving to the potholing that restarts the cycle. Now manufacturers and governments are cottoning onto their findings—and starting to make changes to the ways they make and install it. Those changes won't be enough to save humanity from a 2-degree-Celsius swing, a global temperature hike that will risk worldwide flooding, crop failure, and coral reef damage. But they can make a difference. In California, for example, pavement accounts for about 0.7 percent of greenhouse gas emissions—that's 3 million metric tons of the stuff every year. We can check pavement off our planet-saving shopping list without making appeals to finicky, emotional individuals. And researchers see pavement as an excellent test case for complicated lifecycle analysis calculations for all sorts of products. If someone can come up with an easy way to calculate the environmental dent of pavement, maybe that process can be applied to roofing materials or entire bridges—anything that can be built. Pinker lungs and greener streets, here we come. If pavement doesn’t sound complicated—oh, my friend. The calculations begin with the ingredients. Concrete is made of aggregate, tiny bits of sand, crushed stone, and gravel. Asphalt is composed of sand, gravel, and bitumen, a byproduct of oil petroleum production. (Both can go into pavement.) How much does just obtaining these materials tax the Earth? Oil production is definitely a greenhouse gas emitter, but how much of that process can researchers attribute to bitumen by itself? How far did the bitumen and gravel travel on fossil fuel-spewing trucks? Even if your concrete is “recycled”, a non-recycled, local concrete might emit put less of a dent in the ozone layer overall if it doesn't have to travel to get to the pavers. Now bring on the twists. Does the act of paving itself release particulates into the atmosphere, the kind that irritate lungs and throats? How about the pavement design? Different sites call for different mixes of material based on climate and road use. You won’t want the same pavement mix in a lightly-trafficked Arizona desert town as you would on a Massachusetts highway that gets lots of snow and heavy truck traffic. How does the particular pavement in your particular environment interact with rain, or ice? Does it acidify the water that runs through it, or pump it full of nutrients? Do the pavement ingredients accidentally leach toxins—or carcinogens—into the farm down the way? Break out that very nuanced calculator, because this is an incredibly complex addition problem. Now—and this is the part pavement scientists say always confounds normies—you have to account for the folks trundling over the pavement once it's poured. If your pavement succumbs to cracks and potholes, vehicles driving on it will burn more fuel. If your pavement is too soft, heavy trucks have to work harder to keep their wheels turning. On a micro scale, it’s like driving through quicksand. According to the number crunchers at the Massachusetts Institute of Technology's Concrete Sustainability Hub, vehicles in Virginia burned an extra 1 million tons of CO2 over a seven-year period because of bad pavement. 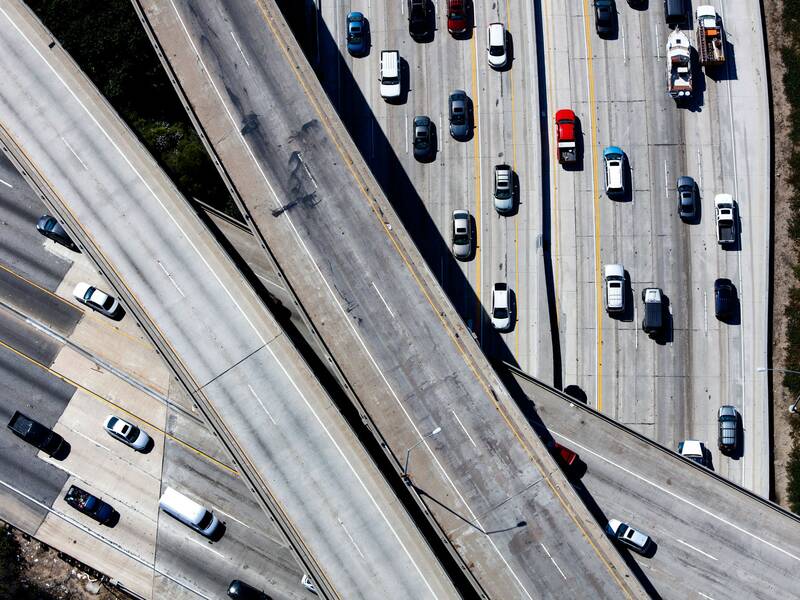 In California—a much bigger state, with 10 times more interstate highway miles—vehicles burned an extra 1 billion gallons over a five-year period. Fortunately, researchers are starting to reach a consensus about what’s smart for the world underneath our feet. In 2015, with funding from the Federal Highway Administration, scientists updated a 450-page reference document on sustainable pavements. And in summer 2016, the government agency put out a pavement life-cycle assessment framework, which will help transportation professionals quantify “environmental impacts over the full life cycle of a product or system, including impacts that occur throughout the supply chain.” Soon agencies will have access to software that helps them hash out the lifelong environmental and fiscal costs of pavement projects. Some agencies are catching on. Caltrans, which manages more than 50,000 miles of freeway in California, uses the hardiest pavement its budget allows, and keeps tabs on the emissions of the heavy-duty trucks carrying its construction materials and equipment. It’s also exploring incorporating environmental product declarations—the eco version of a nutrition label—into the way it sources those materials. But the agency is not yet equipped to evaluate the whole pavement lifecycle, or to rate its contractors’ bids by greenness. “The complexities associated beyond the plant, to the grave, are going to take some time to work out,” says Mark Suchanek, a state pavement engineer and the assistant division chief in Caltrans’ division of maintenance. Years, probably. Meanwhile, the science goes on. Researchers are still pinning down how specific pavements react to different environments over decades. “We still see a lot of opportunity in developing models of the performance of the pavement into the future,” says Jeremy Gregory, who runs the MIT Concrete Sustainability Hub. That could mean driving over the same pavements again and again with sensor-laden vans, to monitor their condition. It could also mean—and this is what Gregory prefers—collecting way more lower quality data from drivers who pilot over the pavement every day: A jolt on a phone’s accelerometer just might mean "pothole." Scientists also warn that they get things wrong. About a decade ago, researchers warned that too dark pavement was absorbing too much heat in cities, hiking air conditioning use. In response, many cities decided to lighten up their pavement, literally—giving it a lighter cast to reflect more heat. Years later, longterm research suggested that this could, in very specific situations, cool down some cities too much, forcing them to burn more fossil fuels to stay warm. That would be a net minus for the good, old planet. The question set off a highly contentious debate in the paving community. “That’s the way science is supposed to work,” Harvey says. The gray stuff may all look the same to you, but it's an A+ scientific guinea pig—and football. And a small starting place, maybe, to save the world. A Weaker Dollar: Desirable or Disastrous?